It took up barely two minutes in a 90-minute movie, but it left me scrambling for a pen and paper to record everything I was seeing and hearing. 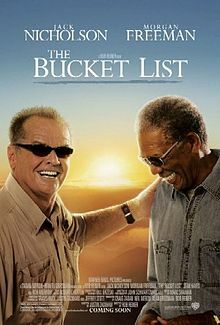 The film is 2007’s The Bucket List, about two terminally ill men (Edward Cole, played by Jack Nicholson and Carter Chambers, portrayed by Morgan Freeman) who go on a round-the-world trip with a wish list of things to do before they “kick the bucket”. Cole: So you think a being of some sort did all this? Cole: You mean, do I believe if I look up in the sky and promise this or that, the ‘Biggie’ will make all this [both have lung cancer] go away? No. Chambers: Then 95 percent of the people on earth are wrong. Cole: If life has taught me anything, it’s that 95 per cent of the people are always wrong. Cole: I honestly envy people who have faith. I just can’t get my head around it. Chambers: Maybe your head’s in the way. Chambers’ suggestion at the end of this exchange truly connects with me. For many years, Cole and I had the same thought about faith. Part of that comes from ego; we humans think we’re so smart, so developed, so sophisticated that we can get answers to everything. Whatever we can’t – well, we just kick it to the side of the road and pretend it doesn’t exist. The other part comes from the battle between heart and mind. While intellect definitely matters in a big way, when all is said and done, faith is a heart matter. That means it’s primarily not scientific and it’s not quantifiable. It’s “fuzzy”. And in our culture, fuzzy is bad. But maybe fuzzy is good. Fuzzy allows room for mystery and God (along with Jesus, whom serious Christians believe is His son) definitely comes gift-wrapped in mystery. Mystery takes us out of our comfort zones and that’s another good thing because it makes us open to new ideas. Such as the concept of a creator who actually loves us and offered the gift of His son to live, die and be resurrected for anyone who accepts that gift. Does this make any sense? Post your thoughts below and let’s have a conversation. Wow! Yours is the second blog I’ve read just today which deals with the idea of a bucket list. Not sure what to make of that . . .
And, yes, our heads (egos) try their darndest to make us think we don’t need faith, don’t need God, when exactly the opposite is true. Faith and hope in God and His promises is what sustains me every single day. “Maybe your head’s in the way.” What an astute observation! Cole’s problem is really the same problem ensnaring unbelievers and much of the church world. Instead of simply believing and obeying the Word of God, we use our education to weigh in on what the Scriptures mean. Instead of saying, “Sirs, what must we do to be saved?”, and then obeying what the apostle Peter commanded (“Repent and be baptized every one of you in the name of Jesus Christ for the remission of sins”), we would rather get into a debate about whether baptism is really necessary, etc. sigh.